As a conversion rate optimisation consultant I find dark UX interesting because it essentially puts the needs of the company before that of the customer. It is the opposite of normal UX principles as dark UX employs design improve your conversion rate by tricking people into taking a decision that may not be in their best interests. Sometimes this can be without them being fully aware of what decision they have made. Dark UX has the potential to leave a bitter taste in your mouth when you realise what has happened. Know one likes being tricked or mislead and the user experience may lead to high levels of distrust and dissatisfaction among customers. This may lead to a short-term uplift in your conversion rate, but in the longer terms this is likely to damage your brand and increase returns and cancellations. In some cases a design breaks a web convention or norm to nudge you in the opposite direction to what you expect. Alternative choice options are sometimes hidden below the fold or reduced in prominence so that you may fail to notice them. Depending upon your point of view you may see this as persuasive design or dark UX. How do we judge what is a great design as opposed to a manipulative design? Here are some interesting examples that could be perceived as great design or dark ux. Good design or dark UX? Amazon is seen as the gold standard in e-commerce and so it’s not generally associated with dark UX. However, I came across this interstitial page for Amazon Prime after clicking on proceed to checkout. The primary call-to-action (CTA) is clearly “Sign up and pay now”, but what if you just want to pay without signing up to Prime? When a user clicks on the “Proceed to checkout” CTA they expect to be served the checkout and so I was surprised and slightly confused to see this page the first time I came across it. I almost instinctively clicked on “Sign up and pay now” without thinking, but then realised the page was trying to get me to sign up to Prime. At first sight it’s not obvious that there is an alternative CTA to “Sign up and pay now”. After a number of seconds scanning the page I found a hyperlink positioned to the left of the primary CTA. 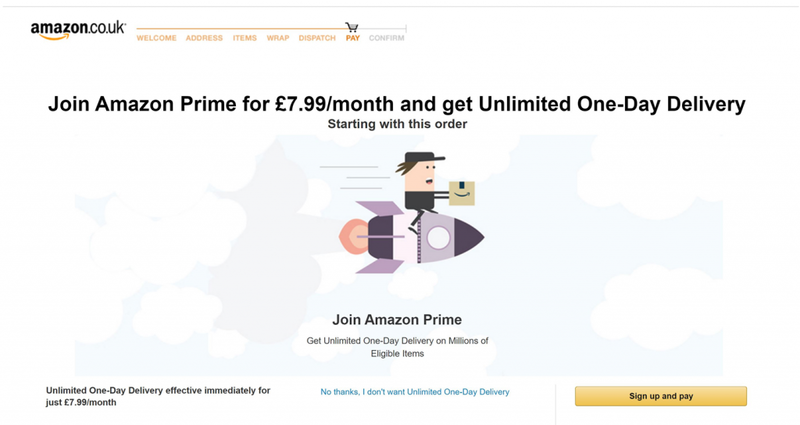 It uses loss aversion to good effect as it reads “No thanks – I don’t want Unlimited One-Day Delivery”. Is this just persuasive design or dark UX – it’s difficult to say. I can see how thoughtful the design is, but could it result in some users signing up to Prime without meaning to? Possibly. 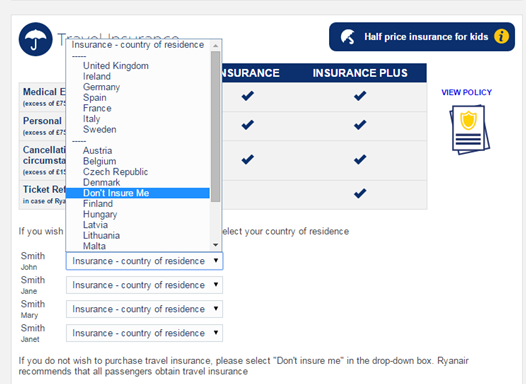 The “Don’t insure me” was hidden between “Denmark” and “Finland”. You also had to select this separately for each passenger because it is under country of residence. This design was heavily criticised by various commentators and may be as a result it has since been replaced by a much more user friendly user interface. 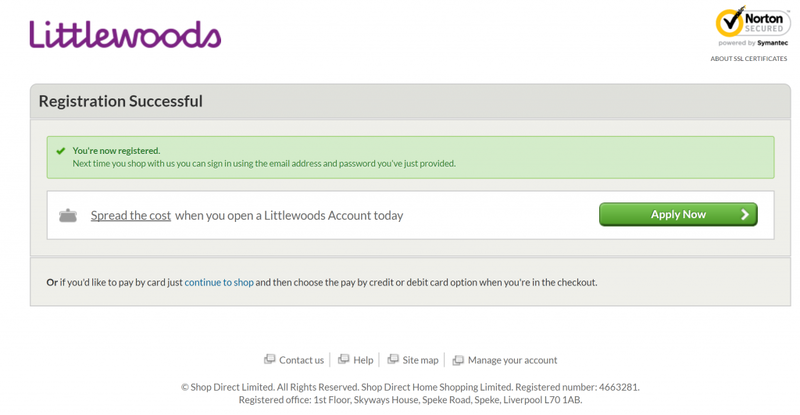 I recently reviewed the Littlewoods.com registration form and was impressed with how it has been improved since I last looked at it. The design uses a very well implemented accordion style form that initially displays three fields and then shows another field when you complete those first fields. When I completed the form I came across the registration successful page below. The primary CTA – “Apply Now” is prominent and a benefit of being able to spread the cost is clearly communicated. However, what if you don’t want to spread the cost and apply for an account? Similar to the Amazon example the alternative action is not immediately obvious. That’s because the alternative payment method is outlined in low contrast text below the discreet horizontal line. 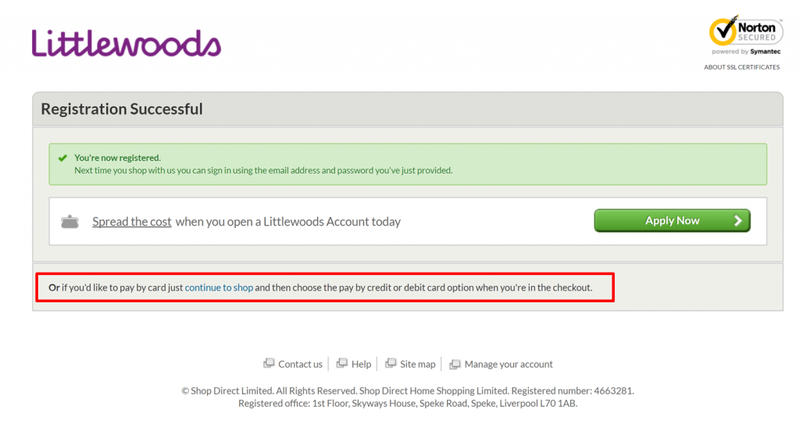 The copy reads; “or if you’d like to pay by card just continue to shop and then choose the pay by credit or debit card option when your’e in the checkout”. I’ve highlighted the copy below to confirm where it is located. From a conversion perspective this is clearly a winner and probably generates a substantial return on investment. The alternative option is visible when you study the page, but many visitors may not notice it before they click on the primary CTA and apply to open a credit account. It is a very well thought out design and is certainly persuasive. What they could test though is the use of loss aversion for the alternative CTA copy. Something like – “No thanks – I don’t want the ability to spread the cost – continue shopping.” This might help offset any drop in conversion if the CTA was made more prominent. The final decision on whether a design meets an organisations’s standards and is consistent with its brand values rests with senior management. Inevitably this reflects the company culture and how customer-centric the organisation is. This explains why sometimes a design may be perceived as persuasive in some organisations and dark in another. When you are working on a new design it can be difficult to take a step back and review it objectively. That’s why usability testing and setting suitable success metrics is so important. If after implementation you see an increase in returns/cancellations or a rise in customer complaints related to the page that is probably giving you the answer. In the end the customer has the final say. If users feel they have been tricked or mislead by how a website is designed they are likely to either complain or switch to a competitor if and when they have the opportunity. Provided customers have a choice to go elsewhere there will always be pressure to remove unsatisfactory design practices. Why Should You Use A Google 5 Day Design Sprint?